Such Scrumptious Junk Food, Can I Have Some? My friend Dana loves the Red Hot Blues corn chips. So do I. I could eat an entire package in a sitting. A handful of Red Hot Blues chips are fine with me. Too much spicy food is not. It’s way too stimulating and I’m stimulated enough without those chips. But when Dana opens that package and dips a chip into a bowl of home-made humus, I have to slow down, breathe and silently ask myself whose hand is reaching into the Red Hot Blues bag. I do my best to keep recognizing when I’m reaching for junk food of a different nature. More damaging than Red Hot Blues. The junk food of victimhood and helplessness. The junk food the Orphan feasts on to validate her Orphanhood and her reality. Sharing my day to day challenges with people who’ll hear and understand us is one thing. The Fertile Heart practice is compassion in action. Compassion toward ourselves and others expressed through continuous, spontaneous acts of kindness. Self-loving and Other-loving kindness. The work is also about sitting up and paying attention when we find ourselves pulled into the Orphan alley by a tempting stream of someone else’s lamentations. From time to time, let’s remind ourselves that this is not an ordinary “infertility community.” That we have a practice and a toolkit to reach into when something hurts. My steadfast team of helpers and I have built this sanctuary with the intention of offering all hungry baby-making travelers a safe space to refuel and some real provisions for the journey. I’ve had the huge honor for a couple of decades now to sit, weep, laugh and celebrate the many, many different paths to parenthood with the Moms and Dads who kept walking until they got to their desired destination. I have rejoiced to see them use this space and our offerings to birth joyful lives. So my sweet friends, if a wounded child shows up at your doorstep, bring her into our circle. Let’s hear her out. Then make sure you don’t get stuck in the dead end street and then try to convince every passerby that the street you live on is the only attainable dwelling place for you and for them. I received two birth announcements in the last couple of weeks: Rather than sharing the thank you notes, I decided to go through some of the emails and comments of these Moms, and I chose one from each of them to share with you. I thought their tone and their words would illuminate what I’m attempting to clarify in this post. “Thank you so much for hosting us and teaching us on Saturday. Your work has been an incredible gift to me in more than just my baby-making journey. It resonates w much of my learning that I am doing right now to have a more full and enriching life. I feel lucky to have you as one of my powerful teachers. I had already been doing some of the Imagery from CD 1 before we met. At the class, you suggested to start Swirling Globe of Light, which I loved from the workshop. But, I can’t figure out which CD that is on (i have imagery CD 1 and 2) Is it called something else? I loved that imagery and would love to continue it. “…I wish there was a call tomorrow night. I am having a really hard time today. We went in today for the first of our luteal blood checks (research purposes – estrogen/progesterone – they don’t tell you results) before “the test” on Thursday to find out if I am pregnant. My head is very spinny and my heart is intermittently racy…. What does your emotional junk food look like and which of the Fertile Heart tools could help you switch to more nourishing emotional edibles. I saw the Red Hot Blues corn chips at the store today! Ha! I stopped in the store to think about my emotional junk food. I have been pondering it again today. I have been speaking to the Natropath and am on supplements for some abnormalities in my blood work and I feel some energy and life returning to myself. I have been standing up for myself more and more. This past month was my 1 year anniversary in a position I took last year at the hospital where I work. I went to my supervisor before it and asked for a pretty big raise. It never really occured to me to do this before for whatever reason. However I have been there a long time and I help train alot of new people and felt it was time. There was absolutely no resistance to my request. I pretty much immediately got the raise! There was some paperwork to sign but it was almost as it was there waiting for me to ask all along and all I had to do was voice my request. Hooray! It was a victory not only finacially but also just mentally for myself. To me this was a visionary action that I thought of – I took action and it happened without a lot of struggle on my part. Thank you FH and your endless lessons! Congrats Gutsymama on your raise! That’s an awesome and inspiring Visionary action that you took! HarmoniousLife – I really appreciate your post about how the practice has helped in your work and in pursuing treatment. I hope your presentation went well. I am in a much better place than when I wrote my initial post. I am working on feeling like I am in the right place at the right time. Trying to bat anxiety away to some extent by reassuring and soothing myself as much as possible. I started reading The Color Purple yesterday. In the foreword, Alice Walker discusses how Celie, the main character, endures so much trauma, but then at the end, realizes essentially what the OVUM Practice is teaching us. That God or the divine or whatever we wish to call it, is all around and that wherever we are is right. I found Julia’s advice on the last call, “There are no mistakes,” very comforting. I am moving forward with this in mind. Not torturing myself about every decision. It feels good. Thank you Sparxy for the reminder that “wherever we are is right”. I’ve been really struggling lately with being at peace where I’m at in life right now. So many things have not gone my way recently but I’m trying to see that I have to live the best life that I can. If I keep complaining and comparing msyelf then I miss the blessings that I do have. I have much to be grateful for in my life and I’m trying to focus on the good instead of the negative orphan talk. Each night my daughter and I say what we’re grateful for. It’s a small Visionary step that I’m taking to focusing on the positive instead of the negative. Growing up I learned that being a martyr is a part of life and I’m working toward changing that view for myself. Thank you Julia and the FH community for supporting me on this journey! Good morning. I am glad I read this blog again before adding this comment. This part spoke directly to me, and has helped me understand that I am already doing my part to get the word out. I have told 3 women in person about this work – one of whom is my very good friend. It’s okay that they are not yet on the circle but I pointed them the way. They have their own unique journeys each one of them. I should let go of any expectation that they would join the circle or workshop. And there are some perhaps many women who get pregnant without this work, and some who hear the precise thing that they needed to hear via the books or blogs without being involved in the circle and that’s totally fine. One needs to be in the mindset to receive the kind of guidance we receive being actively part of this amazing community. I am here because it resonates with me, not because someone else is compelling me. I want to thank Julia for a specific gift. I was asked to do a presentation at a women programmers’ event where I would be the only speaker from my workplace and we were hosting it. And there were to be two other speakers. My director asked me if I would like to do this (this was 3 weeks back and I presented this Monday). If I was not already engaged in FH practice my orphans would have prevailed and either turned down this opportunity or felt bloated to be chosen to do it, or felt like a victim after saying yes. I did have some orphans show up but I took the V rooted action to say yes, because obviously there was tremendous growth opportunity in doing it. I said to myself ‘If 3 women who have been at this company much longer than I and at higher positions think I could pull this off, then maybe I could’ and I think I did. I asked for help, I was open to being guided, and their ideas. I felt that I got the perfect guidance at just the right time. My co-worker recommended me a book ‘Confessions of a public speaker’ that further helped me with my prep. It was super hectic. I dedicated pretty much an entire week non-stop on this presentation and it helped lift a huge weight off me. It’s funny. The day after my presentation I had to be back for cycle monitoring at my clinic, and when I entered the clinic. I realized, I no longer fear the needle as much, because I did public speaking for the first time and it wasn’t a disaster. I survived that, so this needle I shouldn’t be afraid of so much at all anymore. Another side-effect of preparing and giving this talk was that, I am realizing the joy of networking. I always knew networking is important for various reasons but it used to feel like a burden when I thought of doing it by going to open events or conferences. But there’s a new side of me who has started to enjoy networking. And I know this is coming from a place of knowing that I also have something to offer to a conversation, a relationship, and it is not selfish to make new connections. It’s a long comment. I am going to close soon. My imagery/body truth did not happen as often as I liked in the past week due to the prep work, but I have resumed. I switched my imagery from ‘dance of trust’ to ‘possibility’ and continuing with the ‘cry for justice’ body truth. I had not done possibility imagery before, but I love it for its simplicity and hope. Thank you friends for your continued support, and shared insights here and on the circles. Warrior Beagle Wonderful to hear from you and wonderful insights and peacefulwarrior, that is great identifying the orphans. As Julia says they are your children. Most parents are compassionate towards their children and want to help but don’t want then taking over. Harmonious Life, wonderful for using the tools and butterflyfaith, yay for the visionary closing down Facebook. FearlessRose, wonderful for your visionary and UM stepping in. I have been doing New Beginning Fertile Heart Imagery I and First Nursery Fertile Heart imagery II as well as letting my body express the feeling of the moment body truth. I participated in a support group last week for children with challenges similar to my daughter. I am grateful for this opportunity. I learned that some children have major, major challenges, sometimes from their earliest experiences and sometimes it is very difficult on parents. So there are many people with difficulties in the world. My daughter has actually been in a reasonably good state of mind lately, due somewhat to school pressure being off. I am enjoying that! Julia. I was just catching up on the FH community website and feel honored to find that part of my story has been woven into this blog. It’s amazing to read your post and to re-read my words that I wrote some time ago. It’s all so true. It’s what happens in that critical flash of ten seconds after you have a strongly orphan rooted and feeling that can make all the difference. But in that moment, the “right” choice of what to reach for is also often extremely difficult. So very grateful for all the love and support that I’ve received from you and the FH sisters. And so very grateful for these two little miracles that have come into my life. I’m having a very rough day and the junk food today was all this negativity today from doctors, dentists, firends and my orphans are having a field day. The orphans expressed the following ideas today: no financial support so why have another, not enough time for my current situation how could I add one more, having new health concerns for me and my daughter…I’m so exhausted emotionally from the day that I can’t focus on what I still have to get done tonight. I hate when I let the orphans take over. I have to remind myself that there is a visionary inside of me who can be helpful. For example, over the weekend I was at a family gathering where I was involved in another discussion with two women who have more than 1 child each. One was very upset and practically depressed to find out she was pregnant with her last child. She didn’t know if they were going to be able to handle the responsibility of one more for various financial etc. reasons. The other woman said she noticed a trend that women are having at least 3 children nowadays. I of course was speechless and could barely sit still. So I made an exodus to get some food and leave this conversation. It upset me because I’ve always longed for more than 1 child. They don’t know my situation and I wasn’t about to share it with them at that moment. Atleast they didn’t directly ask me but I didn’t want to stick around to find out where the conversation would lead. I feel so down tonight for a few reasons. I have to focus on the positive and yes, I understand I’m blessed to have one child. But somedays that’s not enough. Please forgive me if that sounds selfish. Then the other orphan raging side tonight thinks I should give up and not even bother trying to have another. Who am I kidding? I should focus on birthing a better me using the OVUM tools, but perhaps give up on the idea that someday I may have another. The orphans are screaming that I’m getting older and my husband is getting even more older and what’s the point of trying? I’m going to try and figure out which imagery to do this week to soothe these orphans. I think they need more than just dancing. Checking in tonight. Thank you Julia for the two calls this week! I am continuing with the ‘Dance of Trust’ imagery. I had not been doing body truth consistently, but started last night picking the ‘cry for justice’. I am changing it middle of the week from ‘elbows first’ as i am finding myself a bit low energy and wanted a lying down sequence. I read the ‘Practice, Practice, Practice’ chapter of the Fertile Female and the one after that on my train ride home this evening. It’s amazing how the words drop differently in the mind at different times when reading the same words of this beautiful book. Looking forward to connecting with each of you on the Visionary circle. I’ve been binging on my Facebook junk food, and now I feel gross and unhealthy. I know this is a poor choice, and yet I do it. Even today, when I got yet another pregnancy announcement and a comment from a friend when I mentioned I want more kids; “Wow, you sure are spacing them far apart.” Ouch. I just said “Well, that wasn’t the plan, it just works that way.” I wanted to cry, especially after hearing that latest announcement. It’s really hard seeing people get what they want so easily, so “on time,” so happily, so naturally. Big, happy, close-knit families with loads of kids and cousins and grandparents. So I got myself off Facebook (actually closed out the application–go me! ), made a green smoothie and gathered up some good reading material for our road trip. It will be good to get away from it all and refocus on what matters. I’ll do some Orphans tonight as well as Field of Creation. I have to laugh–my anger orphan looks like the comic Sam Kinison. You remember him? The screamer? But oh how it fits!! Dear Julia, Thank you for this post – it reminded me of my emotional junkfood that I accumulate and, sometimes (more often now than before), when I am feeling strong and inspired, my Visionary takes over and calms the related Os — or, as I did briefly last night, I revel in and eat too much of my junkfood. My emotional junkfood last night was: the feelings that I was being swept away by my self-pity and “it is not fair that I do not have a second baby”. With FH practice, I realised that is my O arriving in full force. So, for some reason, my Visionary and UM just jumped into action and listened to her and soothed her, but that O did not make it to the driving wheel. I feel very much on fire this week, for various reasons and it feels great!! I will enjoy it for now, as I know that it will probably not last forever, but it feels so good to be feeling balanced and inspired. As said, this week, I have been feeling very inspired, putting passion back into my life. The FH medicine I have been taking have been “The Doorway to the Expert Within” and “A New Beginning”, with Body Truths I have been doing Elbows First, Welcome Home and if I have time the Contract/Release sequence. I always feel very grounded, happy and calm after my medicine! The thing I realised a few days ago, too, was that my FH practice is so much a part of my life now that I know it will stay with me in the future. It has brought me so much inner peace and calm. Thank you Julia!! Openhearted, congratulations, congratulations, congratulations. Wishing you the very best! Gabibela, wonderful for engaging in imagery and body truth and Noddfa, good luck with all these emotions. sparxy, the worry orphan is more present for me than I like as well and gutsymama, fear of making a mistake is a powerful orphan. Brave Caterpillar, that is a good point you made about orphans and visionary rooted treats and wonderful sharing about your mother, and Namaste, I love the response “We would love to”. peacefulwarrior, great dancing idea and song butterflyfaith, I love the Star Wars – how uninhibited. peacefulwarrieor, great for thinking out of the box and Anabell, great for being ready for your child now. Harmonious Life , I loved your very visionary steps explaining to friends. I have been doing New Beginnings Imagery Fertile Heart Imagery I and First Nursery Fertile Heart imagery 2 as well as expressing the emotion of the moment body truth. I just had a medical appointment yesterday to see if I needed surgery (not related to fertility) and I am so grateful to say I don’t ( at least not now – maybe never). What a relief. It was so helpful to read all these posts last night. It is great to learn about what tools the FH mamas are using since I am still finding my way around the practice. My emotional junk food is using my job as an excuse to engage more deeply with my practice, and also often, because of my age, doubting about the power of my body to create a healthy baby again. As you recommended Julia, I have been working with The Playground imagery and the Out of the Trap body truth. I have been able to do one of each a day consistently since the last call, and am very happy about that as I thought I would not be able stick to the practice. Instead, I am liking imagery more and more everyday, and really feeling the power of this work. I have also done The Wailing Wall a couple of times. I used to do a similar movement to prepare my body for the birth of my first child. Repeating it now brings me hope and a good, relaxing feeling about my body. It has been so valuable reading all these comments for me tonight. My current emotional junk food is an unusual one for me. Lately I am avoiding solitude (when usually I enjoy it). So much easier to call and visit friends or family after work, than to be with the intense emotions I am currently feeling. Recently I have met a man whom I like very very much. This is a bolt out of the blue and the intensity of what I am feeling is letting me know that my body is trying to flag me down to explore some truths I have been trying to avoid. I find Palace of Truth so helpful when I am experiencing something I don’t want to face. Meeting him is shining a light into the dark corners of my marriage. The last blog is also helping me to know that whilst the timing of this person coming into my life seems very tricky, life is actually unfolding exactly as it should. These emotions are to be explored and not dismissed … but I am finding it hard to commit to my practice, because this is very hard to face. But I trust it because so much seems to be falling into place for me in these recent months in every direction. I just had this moment of gratitude for you and for your work and for this community. It’s past 6 months since I first met you and that was my first interaction with the Fertile Heart practice. I am flattered that you mention on the last circle that I have been to the workshop twice. Part of the credit for that goes to Brave Caterpillar – if she had not opened up to me in the really short window of time we got to talk and told me that it was her second time coming to Woodstock, I may not have had this idea. The first time I came to the workshop because I wanted to do something about this challenge I was facing – this biggest problem I had encountered in my life. She was more of a “task master” – a restless soul looking for something to keep her occupied really. But the person who came to Woodstock the second time had transformed from a “task master” looking for results to an “explorer” – that is my visionary calling to be born. She is an explorer – she will be an explorer for a lifetime. At least I hope she would retain this attitude and keep her heart open to possibilities. And keep the beginner’s mind as Julia reminds us in every email. Thank you Julia. I know this is a bit of an emotional comment for me. Maybe because I just finished watching a tear jerker Bollywood movie (Barfi). But I had to write this note. I didn’t want to lose the moment when I am filled with profound gratitude for this work. I know it’s the visionary who wanted to post this comment today – not the orphan who wants to look outward because the alternative is to look inward and it is obviously scary for her. Last night before I went to bed I did imagery – i too picked ‘Dance of Trust’ since it’s been 7 days since I started ‘room of fear’. And I have heard some great things right here about how FH mommies are working with ‘Dance of Trust’. I continued with ‘elbows first’ body truth. I re-read Heather’s story ebook – maybe for the first time this year. It is so inspiring. Julia had asked one of us to read it. I hope she did. It is helping me to put things in perspective today. I can’t wait to be in the circle tomorrow and on Wednesday. Hi everyone. I’m sorry to have missed the last call. I had a work emergency and couldn’t make it, ut I’m looking forward to Monday’s. When I first read this blog post, my defensive orphan reared up and was actually kind of angry. I didn’t read it well and felt all sorts of food orphans emerging. I have a lot of anxiety about food and sometimes that part of the OVUM practice has actually kind of frustrated me. But then I read others’ posts and the blog again and realized that the point wasn’t about food, but just about the patterns we fall into that are orphan-driven. I am a lot like butterfly – I will stare at my phone, including social media, for way too long and feel completely empty. But I think my biggest junk food is just good old anxiety – I turn to worrying and it makes me feel more comfortable because I am so used to it. First thing in the morning, I lock on to something to worry about and then progress through the day with worry after worry filling me up at the moment, but then leaving me completely spent and without anything to show for it at the end of the day. I am not doing my practice consistently. I try to do Field of Creation at least few times per week, but I feel kind of perfunctory, going through the motions. I made an appt to start IVF this Friday. I talked to the doctor yesterday and she said, we are putting you on big doses of medication. My whole body and spirit recoiled. I feel like I have to do this, like I have no choice, but I just don’t want to. I want a baby and I want to give my mom a grandchild and the scientist and doctor in me feels like this is what I should do, but I feel like I am being led to a volcano to jump in. I made the appointment because i wanted to feel like I was moving forward. But that is not how I feel. I try to find my visionary and most days just can’t hear her. I think my emotional junk food is tending to give myself a hard time and beat myself up for not allowing mishaps or mistakes. At work it is very noticabale if you make a mistake. You do not want to make medication errors or errors in schedules. The stress of it can be a bit much. So I know it can carry into my daily life at times. I have used my tools to help build compassion for the orphan who is afraid of making mistakes and errors. After all some of the greatest growth is after “mistakes”. I have been using A New Beginning. however I am thinking of going to 9 hearts. Will rejoin everyone on the next call. Love to all!! I’ve been thinking about what my junk food is right now. I chose to work with the imagery of Gates of Love and Fulfillment and mixed it up with Defend, Receive and Dance of Trust as body truth. I’ve done that imagery before in the past but I wanted to see if I could get any new insights. At the beginning, Julia mentions something about substituting addictive behaviors with nourishing actions. I used to smoke but I quit six years ago, I stopped drinking alcohol after that, I eat way more vegetables than I used to, I am overall healthier. But there’s always something to turn to. The problem for me relies in the confusion around what really means to pamper myself and that’s what I love about this practice because now I can tell the difference between orphan and visionary rooted actions better. My junk food lately has been eating desserts, shopping, using my cellphone all the time, (to chat, check social media, Facetime, etc.) Many times I engage in this behavior telling myself I am giving me a treat, then feeling bad afterwards. I started to notice which actions were really nurturing when I took visionary actions and then felt so good afterwards, both physically and mentally. While writing this I stopped and asked why I am engaging in this behavior, which orphans are being fed my current junk food? And I came up with this. An orphan who fears to be open to love, who doesn’t trust in her ability to take care of herself, who doesn’t trust in the impact her actions might have on her body or on anything else in her life. An orphan who fears using her time to explore her talents and then begin rejected for them. An orphan who fears connecting with other people face to face and being rejected face to face. An orphan who fears of making new friends, then lose them. It felt so good just to see them. Fear is a powerful orphan for me, an orphan that has paralyzed me many times in the past, maybe she is also afraid I will forget her and abandon her forever, she will lose her power, but she needs to understand that she is missing out on so many things. I think after this week I’ll start working with Room of Fear too and see what comes. Thank you for this, BC. I use my phone ALL the time, too. I mean, even at red lights! I joke I’m addicted to social media and texting, but I think I just may be. I never labeled this as emotional junk food or orphan behavior before. I, too, said it was me unwinding or kicking back. Yet I never felt good about it. I felt more anxious, depressed, angry, frustrated, guilty. It DOES feel good to see them for the orphans they are! Thanks for the insight. I need to figure out why I choose to listen to this orphan behavior instead of more visionary choices. Fear is a strong orphan for me too, the very strongest. You seem to be really in touch with your orphans and I feel deep admiration for you. Emotional junk food. Well, don’t we all have a lot of that! Mine is dabbling in herbal treatments/supplements, subscribing to ideals of others instead of listening to my Visionary, worrying about age, or comparing myself to others. Every time I have done this it has never led me to the results I wanted. The FH practice has given me the permission to keep walking and stay focused. After working on Field of Creation for a while, I am now working on Meeting your Child Halfway. I have needed to stay more connected to my longing so I’m going to play with this for a while and see where it leads, but either way, I’m going to keep walking. On Monday’s call, the story about the Mama who left the baby shower early and the comments from the nosy ladies resonated with me. Good for you for trusting your visionary and doing what was best for you! I have had that same question asked of me numerous times and I wanted to share my response. When someone asks when we’re having more children, or if we would like to have more children I say, “we would love to,” and then stop talking. For me this is a visionary response/action. It doesn’t really allow for any further discussion and it’s true! I whiled away a lot of my evening time today on watching Downton Abbey, Facebook, and Jive, instead of catching up on much needed sleep or prepping for tomorrow’s cooking. I am hardly cooking these days and I know it’s not been good on my body. I did my ‘room of fear’ imagery today. It is a relief that in the imagery UM escorts me out of there to a place of courage and freedom. I hope to make that my waking reality. I also did the ‘circle of protection’ and ‘elbows first’. I wanted to see my dad in the imagery specially today which was the motivation for me to practice ‘circle of protection’. Looking forward to connecting with everyone next week, and in the meantime on the blog. My toxic junk food is complaining about my work, comparing myself to others while entertaining the jealous orphan…I know there is more but at this moment that’s where I’m at. I’m struggling to stop comparing myself and focus more on the healthy non-edible food that Julia offers through imagery exercises and body truth. I have to share that since our call earlier this week, I have been doing elbows first and Dance of Trust imagery. I am loving the dance both the imagery and physical act. I have danced this week with my daughter and we both had a wonderful time. I don’t want to repeat the orphan to orphan relationship I experienced growing up. I’m trying to be a better mom and as Julia reminded me we are not supposed to be angels, so it’s ok when I make mistakes and shouldn’t beat myself up for it. So the dancing this week has been awesome. Tonight I remembered a song that I love and haven’t listened to in ages…Leonard Cohen’s “Dance Me to the End of Love”. Wow! How perfect for me to remember it especially with Julia’s assignment for me to DANCE this week! I love the entire song but especially the words “Dance me to the children who are asking to be born”. This is a song about the various stages of love, but these are special to me on my journey towards another child. I loved dancing to this song with my husband in the past and will definitely make time for it again this weekend. Thanks so much for giving me the perfect assignment Julia! I love how you all this “non-edible food.” That is so on the mark! Thanks for the reminder to dance. I never do, because I honestly have ZERO rhythm and it’s not a pretty sight. ha ha. But when I’m doing “Welcome Home,” I find myself swaying and moving. So maybe my body child wants to dance too? Children don’t care if they look silly–they just love to move. I was watching my son the other day just flip and flop and have the best time (he was singing the “Star Wars” melody while he danced). Why not take a note from his playbook? I agree that children are carefree especially when they move and dance. They truly allow the breathe to move through them and guide them in their movements. I love that innocence about them in many areas of life…they speak what’s on their minds too, they choose clothes in combination that they like and not based on the latest fashion trends, they color, draw and doodle out of the lines. I’m learning to get back to that mindset of “who cares what others think, I’m being true to myself”. One day or even hour at a time (especially if I’m at work) I am working listening to myself rather than meeting standards. I think this is why I get very frustrated and passionate about my work because we’re judged based on unrealistic standards instead of looking at us as individuals. Dear peaceful warrior, thank you so much for sharing this. Reading it brought back one of the most cherished memories I have from my mother. When I was a teenager, a boyfriend that I really liked broke up with me. I was crying a lot with my mother. She always gets a little bit uncomfortable with certain feelings so I guess she didn’t know what else to say and I remember she stood up, played Can’t Get Enough from Your Love from Barry White out loud in our record player and made me dance with her. Thinking about this now made me cry a lot. I wasn’t sure why. I think my orphans always expected my mother to do certain things that she never did because of her own orphans or the way she is. This expectations didn’t allow me to receive her love in the way she could give it to me, through dancing or whatever. I am happy I saw this today, this made me realize how beautiful motherhood is. Some weeks ago she told me that she didn’t know why I read so many books (about parenting, childbirth, lactation), that it was certain that I was going to make mistakes but if I just stayed true to myself and did everything with love, everything was going to be ok. I didn’t pay attention to her that much but now I can see what she meant and it was a beautiful advice. Thank you so much for your post Brave Caterpillar! You reminded me what someone once said to me about my view of my relationship with my mother or shall I say my orphan expectations in our relationship. Basically that she did the best that she could with what she had and if should would have known better then she would have done things differently. For many years I’ve struggled with this because I do understand it through my Visionary lens but my Orphans still disagree. My orphans had different expectations and still do at times. But at least I can recognize them better nowadays. Your post made me cry because it brought up different emotions for me regarding my mother and my daughter. Lately I don’t feel like a good mother and wish I could do more. I’m burnt out from work and some family issues and don’t have the energy that I should for my daughter. I worry that she will look back at these memories and recall the stressed out mother that she had instead of happy times. So I’m really trying to change that. I’m glad you enjoyed the song. I love this idea of emotional junk food. To me, these are the orphans that I can, without even being fully aware of it, default to – in a similar way to how someone might sit down in front the the TV with a tub of Ben & Jerry’s or nachos and without even realising it have devoured the whole load. I have my default orphans, the ones that creep up on me, without me even realising, and have the potential to become like a stuck needle on a record player: like the I’m too old one, or the everyone else has it easier than me one, or the perfectionist one that tells me that unless everything in my life is in perfect order the baby won’t show up. I’ve noticed that when I approach this journey I’m on from a place of trust, everything feels very different. As Julia wrote about so eloquently in the previous blog post, when I trust that the UM is there, whispering to me, also wanting for me what I most deeply desire, and guiding me to it in the way that is right for my unique journey through this life, those orphans simply don’t need to show up as much. Then, the ‘everyone else has it easier’ orphan dissolves, and I stop comparing and simply live and breathe my journey. Then, the ‘I’m too old’ one shifts, when I recognise that it is actually now that I finally truly feel ready to have a baby. And that if I’m being truthful, for a number of reasons I wasn’t ready before, even though on paper it would have appeared to be a ‘better’ time. My go-to FH tools are Field of Creation, Meeting your Child Halfway, Wailing Wall, and Unconditional Gratitude. Plus, generally reminding myself of all the amazing things I have to feel grateful for in my life (while still trying to give the Os the care they need). And trying to enjoy my life day to day as much as I can rather than getting obsessed with just chasing what I don’t have, or comparing myself with others and feeling a sense of lack because of it. Over the last 3 weeks I have felt more anchored in my visionary self. But the last few days, feeling exhausted after an intense 2 weeks of training, and a couple of other things that happened this week, I sensed some Os rising up. I am trying to be kind to myself, to rest more. Not always easy…And to accept that these Os do not mean that the V of the last weeks is gone/the good work undone (which my panic orphan will tell me), but rather that both are part of the dance of life, and sometimes one will be more present than the other. And to remind myself that I have these tools to work with. Beautiful blog post, Julia and delicious insights from all the FH mommies. I am checking in on my practice here today. I picked the ‘Room of Fear’ as my main imagery starting Sunday so I am sticking to it. I feel the need to engage with it more creatively like I did when I did ‘Sacred Choices’ in one of my practices I had the idea of writing down all names of avenues on right and left. It helped to see all those words on one page. I need to do something like that with Room of Fear. If I have time I am doing one more imagery but i have not been consistent with the additional imagery. I really need do add Body truth instead to my practice so I am going to work on that. I am leaning towards ‘Elbows First’ – i only ended up doing it in the workshops but probably not at home, so will begin that tonight. Thank you everyone for the two calls this week. The waking dream exercise was great. I have not seen myself being so courageous in a dream before and I still can’t believe that the dream me decided to walk out of the party. Thank you for sharing this dream. I know I have always needed to work to ‘militantly be on my own side’. Now the practice is helping me see the opportunities to do just that. I also want to share a conversation with my long time friend. She called me out of the blue yesterday. She wasn’t aware of the latest ART path we are on. She made a comment while we were talking that ‘You must be feeling angry about all this’. I kind of felt hurt that instead of saying encouraging words she made that comment of all things. But the comment also made me realize that I am at a point where I see the futility in being angry. That it is never a solution to anything. I also surprised myself by responding very calmly to her and saying ‘well the most difficult thing is the money that we have to spend’. To my surprise, she didn’t know that insurance does not cover most ART. Well, I did say, ‘You are lucky that you are not knowing about these things’. Which made me feel good, because sometimes people get caught up in the stories but they forget to be grateful for what they have. People mean well, especially our friends. But you know sometimes we find them in situations where they may not have the most supportive words at the time. And that’s the time we need to be on our own side and not let their words affect us or derail us even for a moment. I feel I am doing well for myself by protecting myself from such words. Nowadays I hardly talk to any of my (long-time) friends. But that is actually helping me. This same friend had discouraged me when I told her about attending my first workshop in December last year. Her advice was to ‘simply relax’. My visionary was strong enough to completely ignore her. I think that was the moment I kind of made up my mind it’s best I don’t share any of this with my friends – what treatment I am doing, what healing modalities i am following etc. The friends who already have children, that is. It has helped me not to discuss this, and keep it as private as I possibly can. I hardly share my progress even with my immediate family members and that has really helped me to be more calm about everything, which is not easy sometimes. But the moment I share any of this with my mother, she starts questioning about timelines and such, and I know that’s the time to put an end to the topic. I hear myself picking up words from a different vocabulary which is empowering. Julia this is very good to think about – I don’t usually think of thoughts being junk food. That is a good insight. Brave Caterpillar thank you so much for the lullaby and butterflyfaith, that makes sense with emotional junk food. RaeSF congratulations on your baby and Choosing Growthand Vision, yes, emotional junk food is a good term and good luck connecting inward. heather1975teaching I loved the flat spin analogy! I have been doing the visualization of the baby/child I have been connecting to and asking the baby what she/he wants from me and Elbows First body truth. My baby wants me to adore her, enjoy her, not to dessert her when the outside world becomes challenging, and protect her. I’m starting to sing a lullaby to my child. My mom sent us a book of lullabys from various countries (translated into English) with beautiful illustrations when my daughter was small. That is a nice way to connect with my mom as well. I was watching a kids oriented movie and the message was caring for others can build our courage. The fear orphan is coming up a lot but caring for someone else – husband, child, pet, other animals, other people can help. I’m meditating on that. Also, I often cave to the victim orphan and I am reflecting on how to turn that around. That would be junk food for me – the victim orphan reality. The translations from he last blog helped a lot. Que los ángeles van a cantarte y cuidarte para que duermas en paz. That angels will sing and take care of you so you can sleep in peace. Thank you so much Julia for thinking about this, it really moved me. Looking forward to singing with you on our next call! Thank you so much for finding the lullaby. What a sweet tune and soothing & adorable pictures! Also thank you for giving the English translation. Beautiful meaning. I think we should have at least one group singing session in a month on the circles. Lots of love back to you! Thank you for posting the song Brave Caterillar! It’s lovely song. Wow. Julia, you are inside my head again! ;-) This blog speaks to me so clearly right now. Awhile back when you said I was full of sh**, I began to see things more and more clearly. I was like the dieter who, despite being 100 pounds overweight, talks a lot about dieting and eating kale and exercising–so much so she’s exhausted–but she sits on the couch and eats chips and dip. For me, it’s not food that is my emotional junk food, but social media and the Internet. Like CG&V, I find myself researching obsessively, trying to find “the” answer, “the” best combination of vitamins or acupressure or IVF protocol. I cruise around Facebook for disturbing amounts of time. I text a lot or post things on FB. These two latter servings of junk food fill me up and touch on the creativity I’m aching to experience. But again, it’s exactly like eating a Twix instead of a salad. I may have quenched the hunger pains, but I am not nourished. My Visionary is sick and tired of telling me to just write, just take photographs, just exercise my creativity in a positive and nourishing way. Because I don’t. Why? I realized it’s because I’m afraid if I embrace that, that’s it. That’s the end of the game for me and why I’m on this road to begin with. My orphans tell me if I ignore that path, I’ll get to the baby and not get distracted. But now I see that as orphan-speak. Yet the fear still lingers. I’m afraid to pour all of my effort and creativity into this and go with where it leads me because what if the destination is not what I mapped out? I’ve been working with “Welcome Home.” Sometimes I dig right in with “Orphans,” but I like the warmup of “WH.” This past week I’ve been really loving “Tree of Faith and Surrender.” After having a wonky cycle that is very unusual for me, I need that. I also incorporated movement into that imagery (a BT/Imagery combo) and that seemed to really move the needle. I’m going to do the same with “Field of Creation.” A bit afraid to do that though, since my orphans are Angry and Bitter—not sure I won’t hurt myself acting out! ha ha. Thank you all for the call yesterday. Wow…reading that email brought back memories. It also reminds me that I was always “trying to do things right” and part of my work was to realize that there is no “right”. What a journey it was…and what a gift. It was a “scenic route” and luckily, it included finding your work and using it all the way through. When I did get pregnant, I was physically strong and I had so many more tools for the ride. Now, I am holding our sweet baby boy and just in awe that I am here and totally in love. I still have that Circle of Protection around me and continue to take comfort in the support of those physically helping us and those in my imagery work, who are doing their part as well. Meant to add, wishing you much happiness with your baby boy. Dear RaeSF, I am so happy for you! sending you lots of congratulations, too. I remember you, too, from our calls and thank you for coming back to the FH mommies with you baby boy. It has just given me so much hope! I just recalled that we’re supposed to post what tools were currently working with. I’m working with Welcome home every day and intermittently using elbows first. I’m doing ladder of light and sometimes the tree of faith and surrender (a lifesaver at certain moments). Sometimes I switch to field of creation also. This blog was very helpful and apt for me. 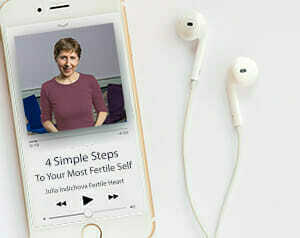 After a recent call with Julia, I realized that researching fertility supplements, fertility questions, fertility foods had become my emotional junk food. They’d become a way to avoid myself, my true feelings – which scared me far more than the idea that I wasn’t taking the right supplement or eating the right foods. My true feelings have to do with old experiences, expectations and habits that are going to require a lot of breathing, body truth, imagery, writing and fearlessness on my part to work through. I’m very scared to keep hoping so strongly, I’m terrified to connect inward at certain moments of the day when I’m sped up, frustrated or feeling off in some way. I’m afraid to face my deep desire and need to write professional articles – a longtime dream of mine that is almost as important to me as a second child (possibly equally as important). To do what it takes to start writing, I have to face a mountain of fear and ingrained habits. But, I see now how this is my next fertility rooted step – this is my next creation that I must move toward. I have been thinking this for a long time but now, at last, I feel it. Whenever the feelings kicks in, I know it will get done. So now I can see the emotional Junk Food more clearly for what it is: an orphan driven distraction from my the next work that my soul needs to do. It’s astounding to me that these posts continue to be written at the exact time when my panic orphan pops her head up like a prairie dog. It’s just magical Julia, thank you. My emotional junk food is what I refer to as a flat spin, in aircraft ( aviation) terms it’s when the rudder and elevator don’t have sufficient air flowing over their surfaces to change the yaw to one needed for recovery, it’s almost unrecoverable except right before impact ( Dad was a USN pilot). Basically you nearly rock bottom before you have a remote chance at recovery. The point being you need airflow…breathing…I have to remind my orphan to breathe and allow her to speak her piece rather than placate her or we enter an emotional flat spin and begin to panic. It can be a cycle of self recrimination or a chance to really work with my O and V. My FH tools are the wailing wall, fork in the road, sacred choices and meeting your child halfway…and my go to…tree of faith and surrender. Dearest Julia, YES!!!! I am PREGNANT!!! Opening the doors to the “dark side” truly allowed more space for my body child and heart to open and receive a BABY!!! Tears of joy and gratitude escape my eyes as I tell you that I am securely in my second trimester, glowing, showing and growing, and SO grateful for your guidance along the way!